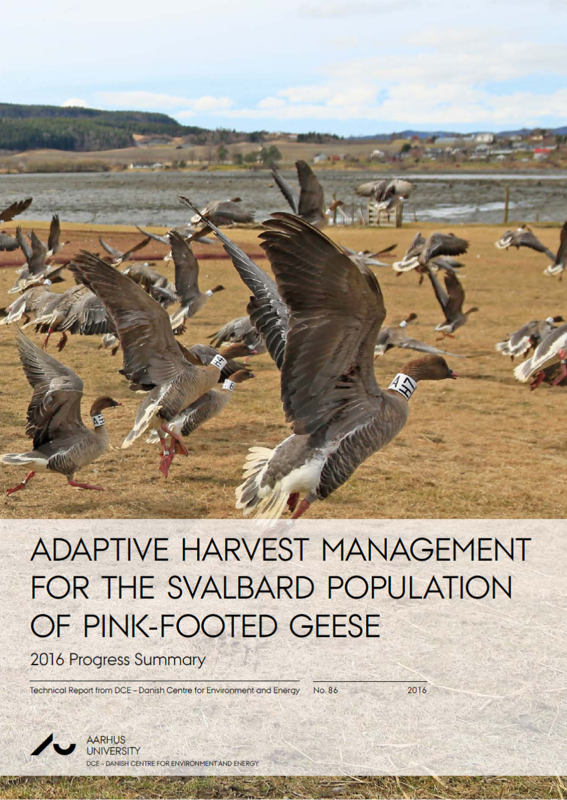 As part of implementing the International Species Management Plan (ISMP) for the Svalbard Pink-footed Goose a number reports are produced to aid management decisions. 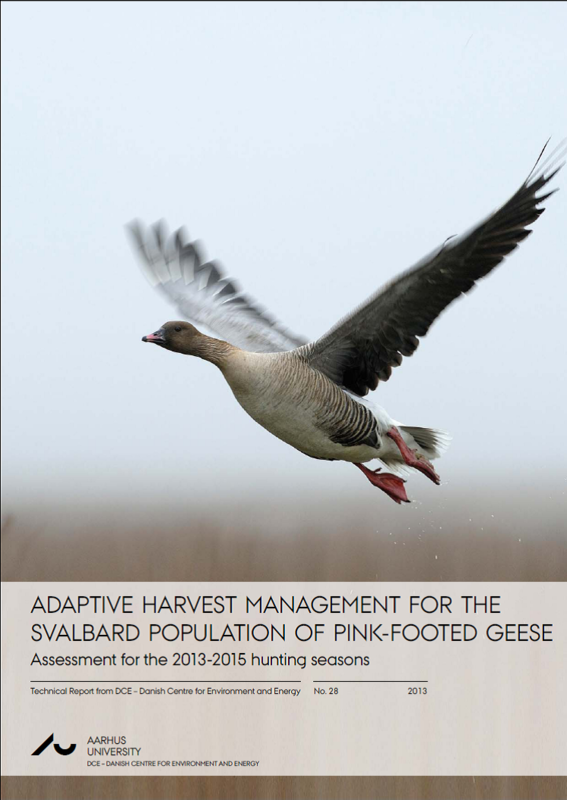 These reports can be found below and are available for download in PDF-format here on the Svalbard Pink-footed Goose International Working Group website. At present there are no plans to produce printed versions of the reports. 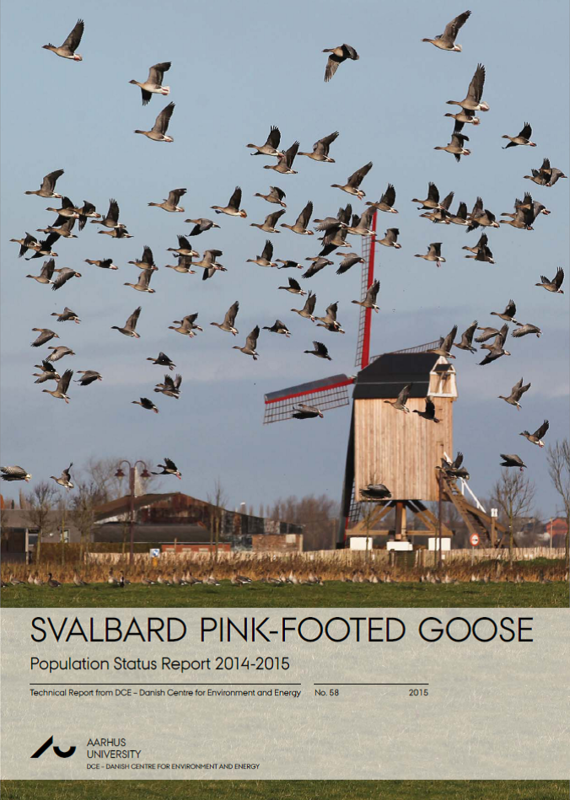 Population Status Report: This report provides an annual overview and comment on the population status of the Svalbard pink-footed goose. It is based on population monitoring data collected and compiled internationally, along with ‘Hunting Bag’ data (estimated number of birds shot) provided by both Norway and Denmark. The data is used to monitor the population development and provide input data for the modelling of an optimal harvest strategy for the population. 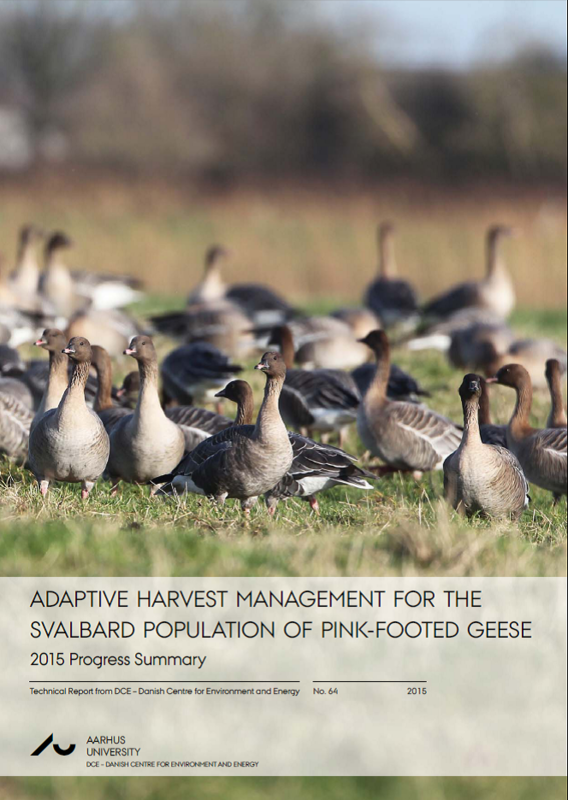 Adaptive Harvest Management Report: This report outlines the adaptive harvest management (AHM) strategy for maintaining the Svalbard population of pink‐footed geese near the agreed target level set out in the ISMP (currently 60,000). It details an annual optimal harvest quota for a 3 year cycle of hunting seasons, providing for sustainable harvests in Norway and Denmark. In addition, it describes the process for evaluating whether hunting closures would be needed during the period, determined as part of an annual AHM review to ensure the population is maintained in Favourable Conservation Status. If you have and comments, queries or require more information about the report series please contact the Coordination Unit. 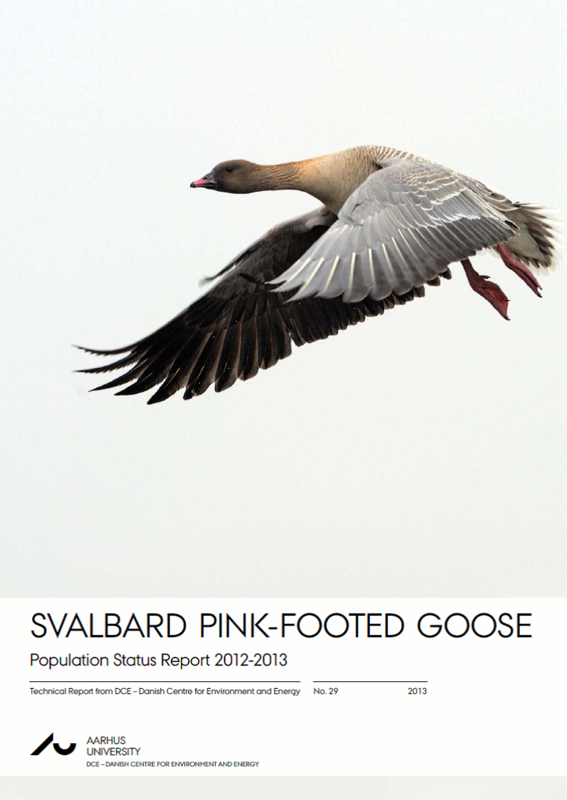 The most recent set of monitoring data (2012-2013) was used to update the Svalbard pink-footed goose population models. The results suggest that the population may have recently experienced a release from density‐dependent mechanisms, corresponding to the period of most rapid growth in population size. Based on these models an optimal harvest strategy has been determined for the 3‐year period 2013‐2015. The strategy suggests that the appropriate annual harvest quota for the 2013‐2015 is 15 thousand individuals; hence there is no need to take emergency measures to close the upcoming hunting season (2013). For comparison, the estimated harvest in 2012 was 11 thousand. If the harvest quota of 15 thousand were met, the expected autumn 2013 population is estimated to be 76 thousand. If only the most recent 3‐year mean harvest were realized (11.5 thousand), we would expect an autumn population size of 80 thousand. Thus, it may be that harvest is approaching the magnitude needed to stabilize the population. The population of the Svalbard pink-footed geese has continued its growth and reached a new peak size of just over 81,000 individuals. However, the rate of increase declined slightly due to a below average productivity as a result of a relatively cold 2012 spring in Svalbard. The overall proportion of juveniles in the population was estimated to be 9.9%. The preliminary 2012 hunting bag data from Denmark and Norway indicate a decrease in the annual harvest of pinkfeet, at just over 11,000. 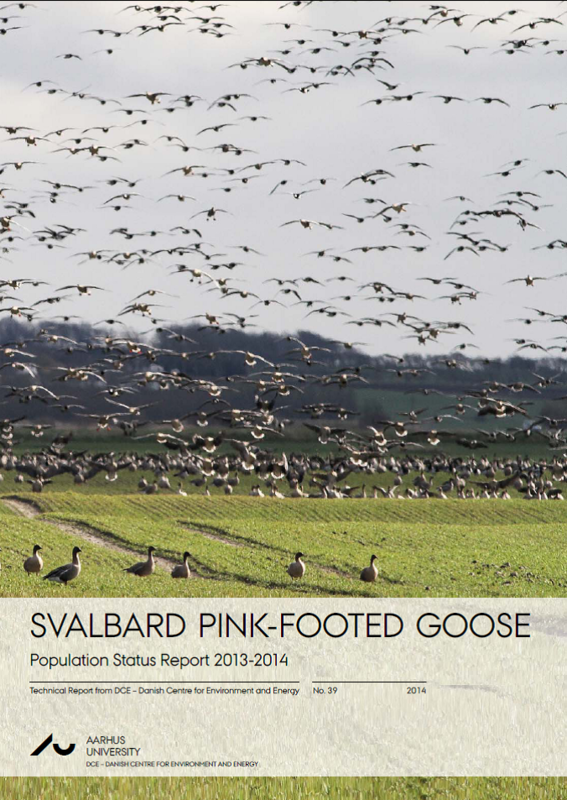 The population estimate for the Svalbard pink-footed goose (rounded to the nearest 1,000) for the 2013/14 season is 76,000 geese. The population seems to have stabilized or even declined for the first time during the recent decade. The overall weighted proportion of juveniles in the population was 11.8% which is below the long-term average of 14.5%. The number of harvested geese remained stable, with a preliminary estimate of 11,081 geese reported shot. The number of pink-footed geese harvested in Denmark increased slightly, compared to the previous year, whilst there was a decline in the Norwegian harvest. During the summer of 2013 an optimal harvest strategy for the 3-year period 2013 – 2015 was recommended. The strategy suggested that the appropriate annual harvest quota is 15 thousand. The 1-year harvest strategy calculated to determine whether an emergency closure of the hunting season is required this year suggested an allowable harvest of 25.0 thousand; thus, a hunting-season closure is not warranted. If the harvest quota of 15 thousand were met in the coming hunting season, the next population count would be expected to be 71.0 thousand. If only the most recent 4-year mean harvest were realized (11.3 thousand), a population size of 74.8 thousand would be expected. Simulations suggest that it will take approximately seven years at current harvest levels to reduce population size to the goal of 60 thousand. However, it is possible that the extension of the forthcoming hunting season in Denmark could result in a total harvest approaching 15 thousand; in this case, simulations suggest it would only take about three years to reach the goal. The population estimate for the Svalbard pink-footed goose (rounded to the nearest 1,000) for the spring of 2015 is 59,000 geese. Population estimates from November 2014 and May 2015, respectively, suggest a substantial decline in the population of c. 14,670 individuals. This decline between counts in November 2014 and May 2015 can be largely explained by the mortality due to hunting and natural causes. It is estimated that in Denmark alone, c. 9,150 geese were shot after the early November count and natural mortality accounted for approximately 2600 individuals, ca. 11,750 individuals. In total, the number of harvested geese increased for the 2014-15 hunting season, with a preliminary estimate of c. 14,800 geese reported shot. Furthermore, the overall weighted proportion of juveniles in the population was 10.3%, below the long-term average of 14.4% (1980-2014). The conclusion is that the population has declined abruptly within the last two years. The optimal harvest strategy for the 2013–2015 hunting seasons prescribed a harvest quota of 15,000 per year. The harvest in the 2014 hunting season was 14,991, compared to 11,081 in 2013, mostly due to an increase in harvest in Denmark during January 2015. The percentage of young in the autumn/fall of 2014 was 10.3%, which is lower than average. The observed population size of 59,000 in May 2015 was much lower than expected. For the 2015 hunting season, observed population size and temperature days suggest that an emergency closure should be considered. In the event a harvest of 15,000 is maintained, predicted population size in May 2016 is 51,700 (95% CL: 41,600-64,300), based on observed TempDays = 9 in May 2015 and the most recent model weights. On the other hand, if the season were closed this year, we would expect a population size of 66,700 (95% CL: 53,600-82,900) in May 2016. A total harvest of 6,700 would be expected to result in a 2016 population size at goal (i.e., 60,000). The Adaptive Harvest Management strategy (AHM) for 2013-2015 prescribed a harvest quota of 15,000 per year, to be shared by Norway and Denmark. Total harvest during the initial AHM period for the 2013-2015 hunting seasons was similar, but more variable (mean = 11,944, sd = 1,798), than during the preceding three years (mean = 11,380, sd = 588). The high variability in harvest during the 2013-2015 hunting seasons has been attributed to the higher-than average harvest in Denmark in January 2015, as a result of an extension of the hunting season (for 1 year). The pink-footed goose population size was similar, but less variable, during the three years of AHM (mean = 74,823, sd = 1,165) compared to the preceding years (mean = 76,867, sd = 6,859). However, recent population counts confirm the suspicion that the count in May 2015 of 59,000 was biased low, and adjustments have been made. As agreed by the International Working Group (IWG), beginning with the 2016 hunting season, harvest quotas will be prescribed on an annual basis rather than every three years because of the potential to better meet population management objectives. The optimal harvest quota for the 2016 hunting season is given as 25,000. The large increase in quota compared to that during first three years of AHM reflects stakeholders’ desire to reduce population size to the goal of 60,000, recognizing that population size remains relatively high and above-average production is expected in 2016 due to a warm spring. The annual harvest quota is expected to average about 8,700 (sd = 9,600) over the long term, although high annual variability in the annual quota can be expected. The optimal harvest strategy remains “knife-edged”, meaning that small changes in the population status can precipitate large changes in the annual harvest quota. This is recognised as a concern to hunters, and the IWG is actively investigating ways in which large swings in harvest quotas might be dampened.